Mitta Mitta Weekender: route details updated in the Calendar. Don't forget to byo sleeping bag. Don't forget to book a bed with the Run Captain (...ahem). Personalised Guzzi plate for sale in the Classifieds. Background The club was formed at a pub in 1981 by several like-minded individuals. It still meets in a pub. We're the largest Moto Guzzi club in Australia. Our club represents all Moto Guzzi owners in Victoria. Owners, riders and aficionados are invited to join. You don't have to own a Moto Guzzi. Meetings Social Sips and Committee Meetings are held on the first Wednesday of every month at the Terminus Hotel, Fitzroy North. Look for the Guzzis parked outside. All members and prospective members are welcome. An informal Social Sip is held on the third Wednesday of the month. Club Rides The club has an organised ride most months of the year. Additionally, there are regular runs to Tasmania and the Snowy's, as well as the Ruptured Budgie Rally in Queensland and the Ragged Fringe Rally in NSW. Details are listed on the Event Calendar. Our ride guidelines are here. The MGCoV won the award for the “foreign group from furthest away” at the 2011 Moto Guzzi 90th anniversary in Mandello, Italy. Australians were the largest non-European contingent, ahead of the USA, Japan and Canada. We went in 2016 for the 95th anniversary, freighted 48 Guzzis and toured Europe! We’ll be back in 2021 for the big one. Club Rally The club's annual Spaghetti Rally is open to all motorcyclists. It's held at the Edi Cutting camp ground on the King River, between Whitfield and Moyhu, in Victoria’s scenic north-east. The club magazine, Genius and Sport, is published bi-monthly. 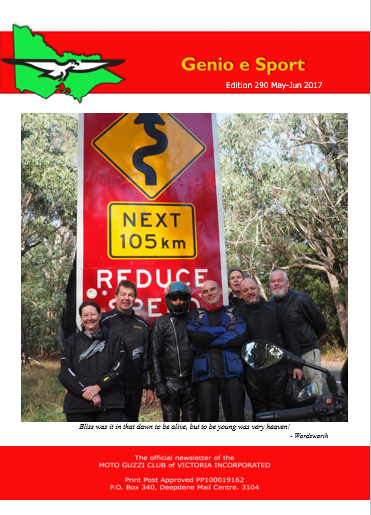 It features ride reports by members about their trips around Australia and the globe, as well as technical and historical articles. The latest copies are here. Club Plates The MGCoV is a VicRoads Approved Club for the Club Permit Scheme (Historic motorcycle registration). We are able to assist members to have their historic motorcycle(s) registered under the Club Plate Scheme. (i.e. 25 years older than the date of Permit Application). VicRoads has introduced new procedures from August 2018. All club plate applications need to go to the Club Plate Scheme Registrar, John Ferguson. the VicRoads club permit application form is here. Warning: if your membership lapses, so does your red plate permit! It’s your responsibility to maintain the currency of your membership – not the Club’s. Club Tools The Club owns a bunch of factory tools and manuals for use by members. Fast access to tools when you need them! Once or twice a year we have a service day where you can learn how to service and maintain your Guzzi from Club experts. Club Merchandise The new MGCoV merchandise site is up and running. Design your own gear here. How to Join Come along to a ride, Social Sip or Committee Meeting. You can pay by electronic funds transfer - check out the details at the bottom of the page here. Or print out the membership form here. Safety Report road hazards and diesel spills to VicRoads on 13 11 70. Stick it in your mobile phone. The MGCoV committee will subsidise motorcycle-specific first aid training for financial members. Up to half the cost will be reimbursed. © MOTO GUZZI Club of Victoria Inc., 2007.